The Lexicon Model 97 “Super Prime Time” is a major advancement in digital audio equipment. With it you can create, store and recall an unlimited variety of effects which you have programmed, in any sequence you like. The standard unit offers a maximum delay time of 480 milliseconds, and memory extension options let you increase that to either 960 milliseconds or 1.92 seconds – all at full 20kHz bandwidth. Because it is exceptionally flexible, as well as programmable, one Lexicon Model 97 can do the job of a dozen conventional signal processing units. Two separate inputs provide versatile mixing and allow for cross-connection of two delay lines for stereo – or for complex processing. Separate input mix, output mix, and delay only outputs are provided. To ensure compatibility with virtually all professional equipment, there are standard phone jacks and balanced XLR connectors, plus a 20 dB input gain boost switch for low-level sources such as electric guitars or -10dBV to -20 dBV line level equipment. The Lexicon Model 97 is perfect for you if you’re a performing musician who needs to work out a variety of special effects prior to the show or recording session, and then have the effects instantly available. That’s because, at the touch of a button, you can store all the Lexicon Model 97’s front panel settings in internal memories, and later recall the settings as needed, in any sequence you like. The storefrecall capability is equally useful to a busy recording engineer, since it allows changing the delay effects with split second timing and unparalleled precision. There are a total of 40 storage registers, 32 of which are user programmable and 8 of which are factory preset. The presets, built-in effects, are typical versions of flanging, resonant flanging, doubling, tripling, chorusing, slap echo, short echo and long echo. You can use them “raw” or, by modifying them, you can very quickly create and store your own customised effects. With 32 memories “on line” several users can store their own effects. Built-in trickle charged Ni-Cad batteries keep the effects in memory after the power is shut Off. However, in those instances where greater storage is required, all 32 user programmable registers (or individual banks of 8 registers) are easily transferred onto magnetic tape, either cassette or reel-to-reel. This makes it possible for you to build an effects library of unlimited size. Effects stored on tape can later be loaded back into your Lexicon Model 97, or any Lexicon Model 97, so you can carry the sound effects without carrying the machine. The Lexicon Model 97 is an invaluable tool in video and motion picture production, where the speed and accuracy of switching effects makes it possible to closely track the effects with the picture. To make the job even easier, the Lexicon Model 97 can be made to automatically cycle through up to 32 stored effects in sync with the program by means of cue tones applied to a spare track of the master audio tape. We have included a number of popular, innovative features from other Lexicon delay processors, such as the ability to combine sine or-square wave LFO modulation of the delay time with envelope follower modulation that tracks the input signalsamplitude, a technique which provides more realistic. less mechanical doubling and flanging effects. We have also included an infinite repeat function, selectable via the front panel ora foot switch, so performers can “capture” a phrase in the delay memory, cause it to repeat indefinitely without signal degradation, and then play against the repeating phrase. 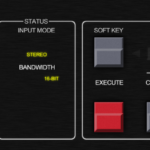 Bypass of all processing is also selectable on the front panel or via a foot switch. Additional foot control jacks enable a performer to sweep the Lexicon Model 97’s delay time over a 3:1 range, and to continuously vary the LFO-modulation rate. In fact, because the rate and sweep functions are based on 0 to 10-volt scaling, synthesizers, sequencers or-automation systems can be directly interfaced to the Lexicon Model 97 to control the effects, adding another dimension to the concept of delay processing. Engineers can take advantage of the remote foot switch and foot control jacks by building suitable hand controls into the mixing console. This avoids the need to reach over to the outboard equipment bay when you wish to bypass the Lexicon Model 97, set it for infinite repeat, step through the memory registers, sweep the delay time, or adjust the LFO rate. The Lexicon Model 97 is further equipped with features found in no other digital delay processor. Features like dynamic recirculation, which makes it possible to achieve long decay times (by using significant amounts of feedback) without “cluttering” the sound. instead of having new sounds continuously overlap with the sounds that are being recirculated, selecting the dynamic recirculation feature automatically reduces the amount of feedback so long as new sounds are present at the Lexicon Model 97 input. When the input signal ceases, the feedback is returned to the set amount so the decay time again increases. Now, without touching a control, the musician can play complex passages which retain their definition, yet enjoy a lingering effect after the last note. Modulation input and output voltage jacks constitute another feature unique to the Lexicon Model 97. These jacks, together with the many audio input and output jacks, make it possible to cross-couple two units for stereo or synchronised multi-channel processing. Clearly, the Lexicon Model 97 ”Super Prime Time” is on the cutting edge of digital audio technology. User friendly yet fully microprocessor controlled, it is a solid, reliable unit. That’s because we have been building professional digital delay lines longer than anyone else we know the ropes. Repeater features 23 authentic emulations of classic delay machines ranging from classic oil cans and tape machines to vintage digital designs – it’s packed with sounds and new features that will add depth to your mixes, and it comes with a user interface that’s immediately easy to understand and tweak. PrimalTap is an emulation and re-imagining of the unique sound and features of the Prime Time delay, a classic digital delay with some powerful performance and sound design capabilities.